Microsoft has revealed several enhancements to SharePoint Online team sites, one of which is tighter integration with the Office 365 suite. If you're not familiar with the concept of SharePoint's team sites, as the name suggests, these are internal websites which can be set up for, say, the sales team to access, allowing staff to share announcements, reports, files and so forth. The first major move is the introduction of a new page authoring and publishing system that allows users to create flash looking feature-rich pages with multimedia content. It's possible to swiftly add images, picture galleries, videos, or indeed elements such as Yammer feeds to make these pages dynamic. All of those bits and pieces can be added to a 'publishing page' via a simple toolbox, and by using the SharePoint Framework, devs will be able to add custom features to this box of tricks. You'll be able to concoct a page simply by opening the Settings menu (the gear icon top-right) and then selecting Add a page. Microsoft has also more deeply integrated team sites with Office 365 groups, so that now, when you create a group within Office, as well as a shared inbox, calendar and so forth, you get a SharePoint team site into the bargain (and vice versa when you create a SharePoint team site, i.e. you also get a group). 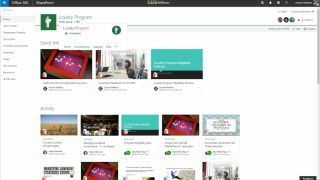 Existing Office 365 groups will also get their own SharePoint team site going forward. Furthermore, another piece of good news is that the SharePoint Online site collection storage limit is set to be upped massively from 1TB to 25TB. The new features will be deployed to existing Office 365 Groups initially, and will begin rolling out to First Release customers starting next week. And the new 25TB storage cap will also start going live next week and should be in place for all Office 365 users inside a month.